Our homegrown tomatillos have been coming in at a trickle, and finally they started rolling in, so last weekend I made tomatillo chili. I’ve been working on this idea for a while, using all grilled or broiled ingredients for a smoky taste. 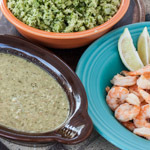 I started by briefly marinating the chicken in lime juice while the tomatillos broiled in the oven, then grilling the chicken and vegetables and briefly sautéing the spices. 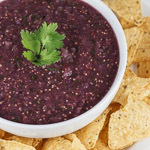 The resulting flavor is smoky and slightly sweet, balanced with a bit of saltiness, and it was a hit with the family. All of my guys went back for seconds, a win in my book. The chili is full of vegetables and only has the fat from the chicken and a couple tablespoons of sunflower oil, making it a very healthy dish. 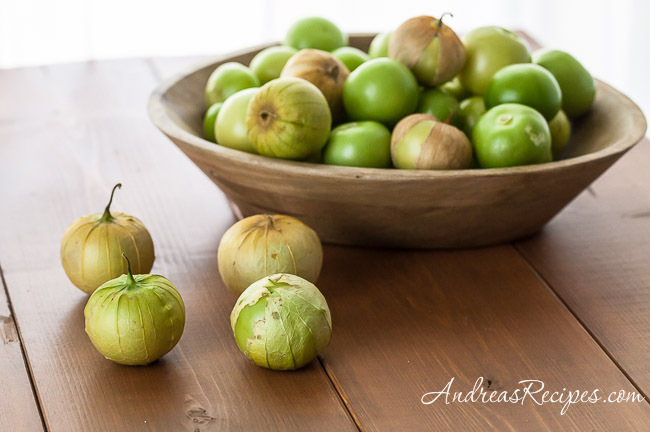 For best flavor, tomatillos should be bright green and fully fill the husks. If they start to lighten and turn yellow, they will be sweet rather than tart. Tomatillos will keep well in the refrigerator for a couple weeks with the husks left on. Put the chicken breasts in a gallon plastic bag and pour the lime juice over them. Seal the bag and allow to marinate about 20 to 30 minutes. Turn the oven on to broil and preheat the grill while the chicken marinates. 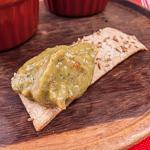 Grill should go to medium/medium-high heat, about 400° F/200° C.
Place the halved tomatillos on the baking sheet and broil in the oven until the tops are charred, about 5 to 10 minutes. Puree the tomatillos plus their juices in the blender. Rub the grill with oil and place the drained chicken breasts, onions, bell peppers, and Anaheim peppers on the grill. Grill the chicken, about 7 to 8 minutes per side. Turn the onions and peppers as each side blackens and blisters, about 4 minutes per side. Remove the chicken and shred with a fork. Dice the onions, and seed and chop the peppers. Warm the pot over medium-high heat and add the oil, then the cumin, chili powder, and black pepper. Sauté until the spices release their aroma, then add the onions and peppers. 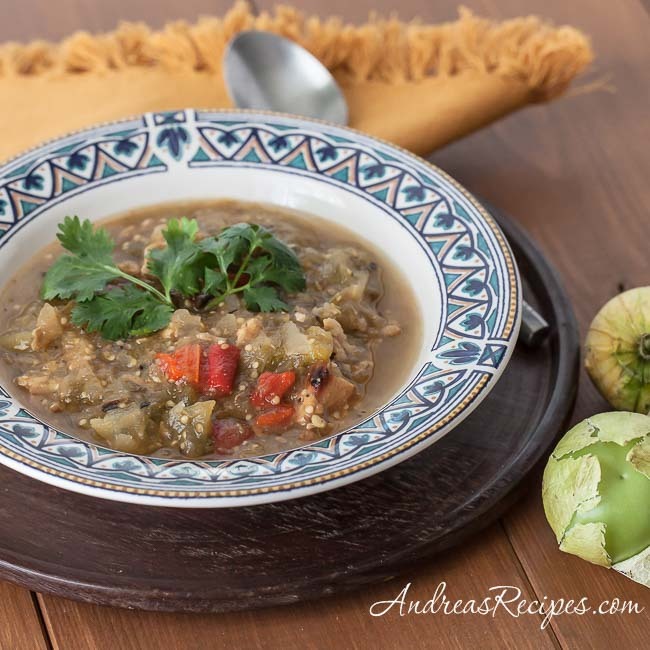 Cook, stirring, about 1 to 23 minutes, then pour in the tomatillo puree and chicken broth. Stir until everything is well combined, then add the shredded chicken. Bring to a boil, then simmer partly covered for about 20 minutes. Taste and add salt to taste. I have some volunteer tomatillos that are going to be ready soon. Love them, and love the sound of this! Thanks Kalyn! Isn’t it great to have volunteers? Love chili! Also, really like your plate. I am sitting here drooling over this dish! I am a self proclaimed Chili fanatic. This looks delicious!